I am not confortable going into details. More or less i had in mind the transmission of dzogchen state as is explained by Rongzom and others. I already said too much. But, to be clear, there is "Tendrel" in play here; it is not the words alone which effect the recognition. The student has to be "prepared," so to speak...receptive and attentive, and some compassion and devotion may help grease the wheels too. That's part of the Karmic connection, too, I think. Oh, excellent point, I skipped that point thinking how most people come into these situations through some previous search, but great point in the case where one's karma ripened in such a way that they sort of stumble in onto the scenario of being with a root guru. Honestly, I didn't believe or disbelieve. I plain and simple just didn't know and I simply applied the instructions the best that I could with a pure intention. And then I did experience that profound unequivocal recognition or confidence. I consistently applied the method as well as I could, all the confidence began to manifest in various ways that will never be altogether logical. As Greg noted, it's not really meant to satisfy the rationalizing mind, that's not its purpose. I have verified that. So my question in this thread is... what happens when your root teacher dies? This is something that I've been wondering. Does the root relationship stay with you? but sure this connection stays as-well-as it transforms into something new. The Guru leaving this world physically provoces more internalization of the devoted student's inner guru. Admittedly I hope for Sogyal's (former) students to advance on this path. He hasn't deceased but still he is ceased somehow. Switching over to another Guru doesn't feel rigt. But I'm not affected and I don't want to judge. My root teacher died, it left me drifting a little but there is still an incredible connection. Last week I found my notes from a retreat I did with him. I wrote down everything he said word for word at the time and tbh, I am again shocked by the profundity of his teaching, reading it all again. It was no ordinary teaching. I recall being exhausted as he talked, for hours and hours from dawn till night, I wish I could share it with others. 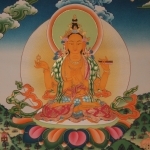 The aspect of the root lama that Lungtok Tenpe Nyima calls "the principal lama", i.e., the form with characteristics, is but one aspect of the lama-disciple nexus (and it is a large mistake to consider the root lama as wholly contained in the particular human form whose interaction with you made him or her your root lama). If he or she really was your root lama (I am speaking in the Nyingmapa sense), then the interaction cannot but continue after the human form disappears. So the short answer is, of course. What interesting responses everyone! Tharpa... Wow I got chills reading what you wrote. I could feel it as if I'd lived that before!